Millie Ashton thinks London society is full of empty headed, arrogant fools, but when she meets Alex Radley, she falls desperately in love with him. Fearing humiliation and rejection, she decides the only sensible thing to do is take her pride and go home to India. Men like Alex do not fall for girls like her, whereas every girl loses her heart to Alexander the Great. Alex Millie Ashton thinks London society is full of empty headed, arrogant fools, but when she meets Alex Radley, she falls desperately in love with him. Fearing humiliation and rejection, she decides the only sensible thing to do is take her pride and go home to India. Men like Alex do not fall for girls like her, whereas every girl loses her heart to Alexander the Great. Alex Radley, Marquess of Brooke, rules the ton like a god, but even gods are known to fall for mere mortals. With his wealth and title, wooing Millie should be an easy task. But when his passionate love letter to her goes astray, Alex’s life becomes more than a little complicated. To ask other readers questions about Letter from a Rake, please sign up. Millie Ashton and her family have returned to London after years living in India. Millie misses India so much, she can barely breathe. London is too stuffy but seems less so when she befriends Lucy Radley. They appear to be bosom buddies. Lucy's older brother, Alex, is handsome and every young lady is vying for his hand. He couldn't possibly be attracted to Millie, a full-figured young lady who wears a nose ring, could he? From the moment he first lays eyes on Millie Ashton, Alex is smitten. He Millie Ashton and her family have returned to London after years living in India. Millie misses India so much, she can barely breathe. London is too stuffy but seems less so when she befriends Lucy Radley. They appear to be bosom buddies. Lucy's older brother, Alex, is handsome and every young lady is vying for his hand. He couldn't possibly be attracted to Millie, a full-figured young lady who wears a nose ring, could he? From the moment he first lays eyes on Millie Ashton, Alex is smitten. He loves her curves and thinks she's the most beautiful jewel in all of England. He's so awestruck, he can't even speak to her at the ball. She's embarrassed and he has to make it right. But every time he's around her, he messes up. He tries everything he can to woo her but can't find the words. He enlists his brother's help but when the love letter is sent to the wrong young lady, he fears he's lost his Millie forever. Can he reveal his deep dark secret to Millie and show her how much he loves her or is it too late? What a brilliant story! I loved the fact that Cottman's heroine was not rail-thin. She's feisty and yearns for India, her homeland. She feels lost and alone in England. There's depth to this romance, too, which I didn't expect. I fell in love with both families and can't wait to read more in the series. This lovely, gentle Regency romance was exactly what I needed to while away a rainy Saturday (no washing or housework done as a result!) I really enjoyed the interactions between the hero and heroine. The conflicts were simple but really well woven into the story and even though you knew what the hero needed to do to set things to rights after his letter went astray with disastrous consequences, it was really well done how author, Sasha Cottman got us to that place. The hero was an alpha-type wi This lovely, gentle Regency romance was exactly what I needed to while away a rainy Saturday (no washing or housework done as a result!) I really enjoyed the interactions between the hero and heroine. The conflicts were simple but really well woven into the story and even though you knew what the hero needed to do to set things to rights after his letter went astray with disastrous consequences, it was really well done how author, Sasha Cottman got us to that place. The hero was an alpha-type with beta qualities that made him really endearing and a nice change from some other overbearing alpha-type heroes who always tell the heroine what to do. I also loved that he was interested right from the start and it was her who had to be convinced.As for the heroine, Millie, she was the proverbial duckling who turned into a swan, but what I really liked about her, was her transformation wasn't overdone (she didn't become a diamond) and that the hero loved her and was attracted to her right from the first. It was a great message about attraction and appearances. Millicent/Millie Ashton has come to London with her parents from Calcutta India. She was born there. Her father, mother and brother left England to go a build the family fortunes back up. Now they are very rich and have returned home to London. Millie is having trouble making friends and being excepted by the other younger debutants. She is miserable until she meet Lady Lucy Radley the daughter of the Duke of Strathmore and then she is introduced to Lucy's brothers Alex the Marquess of Brooke an Millicent/Millie Ashton has come to London with her parents from Calcutta India. She was born there. Her father, mother and brother left England to go a build the family fortunes back up. Now they are very rich and have returned home to London. Millie is having trouble making friends and being excepted by the other younger debutants. She is miserable until she meet Lady Lucy Radley the daughter of the Duke of Strathmore and then she is introduced to Lucy's brothers Alex the Marquess of Brooke and David. They are attending a Ball and Alex falls immediately in lust with Millie. The two go on the entire book having one misunderstand after another way to much angst. When all they had to do was talk to each other. I hate a story filled with misunderstandings and miscommunication. The nose ring Millie wore also, didn't work. It just didn't fit in with the Ton of 1817 no young lady from a respectable family would be wearing a nose ring. I did love that Millie was 20 and not yet a spinster and she was not poor she had a fat dairy. I hate reading about spinsters that storyline is overdone. She was rich and from a well respected family. I love that Alex was from one of the riches families in England and from a Powerful old Dukedom. What a wonderful debut novel by Sasha Cottman. A light, charming and very enjoyable Regency romance with an original plot, an appealing, unconventional heroine, Millie Ashton, and a very dishy hero, Alex Radley, Lord Brooke. I particularly enjoyed the banter between Millie and Alex and the fact that Alex unashamedly falls for Mille. He was a nice change from the typical Regency bad boy. Highly recommended for fans of the genre. I look forward to reading Ms. Cottman's next installment! less endowed & had a smaller waist. To get these fast wt. amphetamines? Ironically the he London 1817.
amphetamines? Ironically the hero liked her curves. though she appeared to be intelligent and have common sense. made the story seem too long. Miss Millie Ashton has just arrived in England after spending her whole life growing up in India where her father worked. She finds London in March chilly and depressing and her sapphire nose ring and curvaceous figure draw the disdain and ridicule of the lithe London debutantes and she comes to dislike having to attend society events. But then Millie meets Lucy Radley, a kindred spirit and through her, Lucy’s two older brothers, Alex the Marquis of Brooke and David. Millie is drawn by Alex’s blo Miss Millie Ashton has just arrived in England after spending her whole life growing up in India where her father worked. She finds London in March chilly and depressing and her sapphire nose ring and curvaceous figure draw the disdain and ridicule of the lithe London debutantes and she comes to dislike having to attend society events. But then Millie meets Lucy Radley, a kindred spirit and through her, Lucy’s two older brothers, Alex the Marquis of Brooke and David. Millie is drawn by Alex’s blonde perfection but he humiliates her on the dance floor in front of everyone at a ball, just one more slight that she’s had to face since she came to England. However Alex apologises, more than once and Millie finds herself enjoying a friendship with one of London’s most eligible bachelors. The two of them spend more time together until a careless lack of judgement on both their parts nearly leads to Millie’s social ruin. Alex knows that he must make amends – he realises that Millie believes that he doesn’t care for her when that simply isn’t the case. And so he decides he will write her a love letter, something that shows her beyond all shadow of a doubt how he feels. But Alex has a secret and so he must enlist some help…and that sets in motion and chain of disastrous events that tears him and Millie further apart than ever and also has the potential to greatly hurt innocent bystanders. Having always relied upon people to help get him out of trouble, Alex is now on his own to fix this big mess and win the hand of the woman he loves. Letter From A Rake is one of the latest Destiny Romance digital first titles and it’s a refreshing type of historical romance. Millie was born in India, her father having gone there to help restore the family fortune. She spent 20 years there before her father was posted back to London and she immediately finds herself a fish out of water. She doesn’t make friends, she doesn’t enjoy the stilted, social situations that come with the requisite backstabbing and nastiness and she wants nothing more than to return to India. Millie is also generously proportioned – it’s never stated exactly how much, but she’s described as “chubby” in the book and seems to have an hourglass type of figure, which is definitely out of fashion. She’s ridiculed, called an “elephant” so that she can hear and embarrassed by people that snub her. Meeting Lucy Radley is a blessing – the two of them are very similar and it gives Millie her first London friend and allows her to meet Alex. Despite their rocky beginning, she develops a crush on him and accepts his apology. I never used to read much in the way of historical romance – I never found them spicy enough for my liking but then I realised that I was just reading the wrong ones! I read a lot more now and I enjoy a good story set among the ton. This one really caught my attention because of the character of Millie. She’s so interesting – a woman with a nose ring in society London! She’s also an avid reader and owns not one but two copies of the Kama Sutra. She and Alex made an interesting pair and I thought that Alex was quite a different hero to the type I’m used to reading too. Although he’s a bit of a rake (his reputation alludes to this anyway) from the moment he first spots Millie, he’s smitten with her looks and her attitude. What he likes about her is the very thing that others have snubbed her for – her generous curves, the sapphire in her nose that matches the brilliant blue of her eyes. He’s drawn to everything that makes her Millie. He probably is thrown into the path of many debutantes, all looking to snare themselves a titled and wealthy husband. Millie doesn’t have much of an interest in this, in fact the most she’s looking for in a husband is someone that will take her back to her beloved India. I found the real reason he snubbed her on the dance floor hilarious and not really what I was expecting. It was amusing to read of his incapacitation. The author also gifts him with something I’ve never before seen in a historical romance, which really seeks to complicate the plot. That was a clever addition, something definitely unexpected and something that humanised Alex, made him sympathetic and less remote. Often the heroes in romance, of any type, are very aloof and it’s hard to crack past that exterior. That can be attractive in its own right but Alex was different and he matched up well with Millie, who was also different. I appreciated that, it really felt like they went well together. I enjoyed this so much! Millie and Alex are gorgeous. It's so nice to read a story about people you can like and there are a lot of likeable people in this. I've been sick as sick lately. I had to drag myself out of bed to work but when I had finished what I had to, I needed a break and this was a perfect dose of R&R. Well done Sasha and hurry up with David's story! I had a great time reading this story of the lovely Millie Ashton and the gorgeous Alex Radley, set in the early 1800s in England. Millie was a wonderful heroine - I rooted for her from page 1, and while Alex had his moments (I don't know I've ever found a bloke so wrapped up in getting rid of the bags under his eyes and having a good night's sleep so he would appear refreshed) - I feel sure these are probably most typical of men of the 'ton' at the time, which means of course that the author got I had a great time reading this story of the lovely Millie Ashton and the gorgeous Alex Radley, set in the early 1800s in England. Millie was a wonderful heroine - I rooted for her from page 1, and while Alex had his moments (I don't know I've ever found a bloke so wrapped up in getting rid of the bags under his eyes and having a good night's sleep so he would appear refreshed) - I feel sure these are probably most typical of men of the 'ton' at the time, which means of course that the author got it all spot on. I loved returning to Millie's story every time I put down, and picked up the book. I enjoyed the predicament Alex got himself into with the lost letter, although the 'letter from a rake' took quite a long time to work its way into the story. Very enjoyable and I look forward to Lady Clarice and David's story. This is a delightful debut novel, written with wit and verve. The protagonists, Alex and Millie are young and fresh and make a wonderful change from the world weary protagonists of most "Regency" novels. While Alex may be more of an apprentice rake, he is hiding a shameful secret and Millie, fresh off the boat from India, is the outsider, too plump to be fashionable and sporting a decidedly unfashionable stud in her nose. Like the youngsters they are, they tend to act with their hearts not their This is a delightful debut novel, written with wit and verve. The protagonists, Alex and Millie are young and fresh and make a wonderful change from the world weary protagonists of most "Regency" novels. While Alex may be more of an apprentice rake, he is hiding a shameful secret and Millie, fresh off the boat from India, is the outsider, too plump to be fashionable and sporting a decidedly unfashionable stud in her nose. Like the youngsters they are, they tend to act with their hearts not their heads. What I particularly loved about this story is that both Alex and Millie come from grounded, loving 3 dimensional families. The parents of both are present and available to provide the good counsel the youngsters need. I read Letter From A Rake at the beginning of the year and just picked it up again. Ms. Cottman has a wonderful way with words that draws you in within a matter of minutes. Millie and Alex are characters that really stick in your mind. I didn't realize how much until I started reading again this time and felt like I was visiting old friends. Give this lovely little number a read, you won't regret it. Romantic and a little different plot line than most. No villain. No kidnapping. Nice. FAKE Regency, if not for the story line, I would have given it a one star rating. It is so full of contemporary words and phrases all applied on present day context that put me in a Time Warp wondering if the setting is Present Day or Regency England. How, pray tell, can a bureaucratic phrase like "in/at this juncture" or words like "bulletproof plan" be used as common or usual everyday words in conversations during the Regency period when the etymology of such words have NOT yet occurred? and a FAKE Regency, if not for the story line, I would have given it a one star rating. It is so full of contemporary words and phrases all applied on present day context that put me in a Time Warp wondering if the setting is Present Day or Regency England. How, pray tell, can a bureaucratic phrase like "in/at this juncture" or words like "bulletproof plan" be used as common or usual everyday words in conversations during the Regency period when the etymology of such words have NOT yet occurred? and also use of the word "so" in today's context? Dear Author, if you are to write about a specific timeline, please do your research (on the language/word origins on the basis of historical probability not just on the culture/customs) first? and do try to achieve a certain level of authenticity? Plus edit before you publish? This work makes you a charlatan and insults the reader. This book tells the story of Alex ‘Alex the Great’ Radley and Mille Aston who first meeting sets of a running conflict between the two. Both intelligent creatures , the hero realises he needs to set things right with the lovely Miss Ashton and set on a journey of bumbling mistakes that lead to a disastrous situation. The plot is so simple but the author weaves her magic with her writing style and creating characters that are appealing to us readers and who don’t fit the typical hero or heroine we have come to expect in historical regency romances. It takes the story too the next level and makes it a standout for me. My particular favourite aside from the heroine was the delightful Lucy Radley who was determined to see her new friend and brother happy. She maybe a young woman seeking a suitable husband but this lady got a mischievous streak that seems so out of place that I love . I only wished I read this sooner, as the author has a heroine that I enjoyed so much for her quirkiness and strong will nature. I loved the influence of childhood home in her appearance and that the hero loved it as well. Despite his reputation as a rake, I think this hero is a softy underneath it all. He was just waiting for the right woman and Millie Aston was that woman. 4.5 couples and I’m excited that this was her debut and that I had her next book ready to go when I finished it as there was about a year between these books and I’m curious to see if the magic continued. This review has been hidden because it contains spoilers. To view it, click here. I loved this book!!! I was given this nook through Netgalley in exchange for an honest review and I have to say this is a wonderful book. set in London in 1817, it tells the story of Milicent (Millie) Ashton, whose family has just moved back to London from India. Millie's and her brother Charles were born in India and are trying to learn the ways of the ton. Millie is having a difficult time because she does not fit the mold of the proper English lady...she has curves, in other words she is more I loved this book!!! I was given this nook through Netgalley in exchange for an honest review and I have to say this is a wonderful book. set in London in 1817, it tells the story of Milicent (Millie) Ashton, whose family has just moved back to London from India. Millie's and her brother Charles were born in India and are trying to learn the ways of the ton. Millie is having a difficult time because she does not fit the mold of the proper English lady...she has curves, in other words she is more like a real woman. I found this to be a delightful change, but what was even better is that a Marquess, Alex Radley, fell for her and curves from the first time he laid eyes on her. Millie has a sense of humor, curses with best of them and does not titter and throw herself at Alex's feet like the rest of the eligible girls do, and Alex likes that. Another issue that I have not read about in any of the historical romance novels I have read is illiteracy among the ton. Alex is unable to read or write, he says "everything gets mixed up on the page." I believe he may be dyslexic. The family covers this 'shame' by not telling anyone and having Alex learn by rote memorization. Alex's inability to read and write is the root of the major conflict in the book, because of this, Alex has to decide if he will keep his secret from Millie and lose her forever or come clean and take the chance she may turn her back on him when she learns his secret. The author weave a tale that is intriguing, heartbreaking and believable. I could feel Millie and Alex's pain, she at the rejection by the ton because she is not a tiny waif, and he because of his inability to read and write, calling himself an idiot and a simpleton. The characters were far too immature. The only rake-like characteristics that Alex shows is his penitent fo I'm going to come right out with it and say that I, obviously, was not the target audience for this book. This is the perfect story for Regency Romance lovers. An easy read I couldn't put it down. The romance is engaging. The pacing of the story is good and the plot is well thought out with unexpected twists. There is an interesting amount of historical detail throughout which enhances the book. Millie is an unconventional heroine for a Regency romance. She was born and lived in India and so provides a fresh perspective on Regency society's constraints on women. An endearing combination of feisty and vulnerable make Millie attractive both to the reader and the hero. Alex is a likeable rake. The insights the reader is given into his thoughts allow you to like him even when he unwittingly breaks Millie's heart. The story is full of layered conflict which keep you turning the pages. Whilst not a steamy romance. The ending definitely raises the temperature and gives Letter From A Rake its Happy Ever After. I enjoyed this and would recommend it. I received a copy of this book from Penguin Books Australia, Destiny Romance via NetGalley in return for an honest review. Letter for a Rake is the kind of story that I adore simply for how sweet and enjoyable it is to read. The storyline isn’t chocked full of angst and the main characters are genuinely good people who get caught up in a bad situation that keeps them apart. Twenty year old Millie Ashton is feeling quite the culture shock when she returns to her parent’s homeland of England. Born and raised in India, Millie isn’t used to the pretentiousness she encounters while making calls on society women or just wi Letter for a Rake is the kind of story that I adore simply for how sweet and enjoyable it is to read. The storyline isn’t chocked full of angst and the main characters are genuinely good people who get caught up in a bad situation that keeps them apart. Twenty year old Millie Ashton is feeling quite the culture shock when she returns to her parent’s homeland of England. Born and raised in India, Millie isn’t used to the pretentiousness she encounters while making calls on society women or just within the city of London itself. While her parents and older brother are happy to pick back up with the lives they had left behind, Millie knows that she doesn’t quite fit in. Her looks are more on the side of buxom and brunette rather than the social ideal of blond and waifish. Her interests are more scholarly than the expected womanly pursuits of fashion and gossip. And she sports a small nose ring that is definitely not on the dress code at Almack’s. Even as one of the guests of honor at a Welcome Home ball, Millie is happier keeping herself to the sidelines rather than risking more teasing or censure from her peers. Fortunately for her, being on the sidelines will change her life more than she realizes. Congratulation to the author, this is definitely a great first novel and it's my favourite kind of love story too! Sasha Cottman has an intriguing, merry and exciting style; the story is full of passion but not in the Kleypas or Quinn's way: everything here is softer and more delicate (I'm not saying that against the just mentioned authors that I said I adore, more than once), the novel doesn't lack of moments of pure emotion, spiced with elements that surely can't be defined chaste; in Letter f Congratulation to the author, this is definitely a great first novel and it's my favourite kind of love story too! Sasha Cottman has an intriguing, merry and exciting style; the story is full of passion but not in the Kleypas or Quinn's way: everything here is softer and more delicate (I'm not saying that against the just mentioned authors that I said I adore, more than once), the novel doesn't lack of moments of pure emotion, spiced with elements that surely can't be defined chaste; in Letter from a rake the mix is less marked but equally intense and enjoyable. The characters are wonderful and doubtless well-characterised; Alex is adorable in feeling himself inadequate towards an emotion he experiences for the first time and which suddenly and promptly explodes in his life; he is sweet, passionate but also clumsy when Milli is next to him and his reactions are too funny. She is insecure and she feels out of place; it's easy to empathise with her, her attitude and diffidence. I felt quite the satisfaction in her personal growth and awareness. I have to mention the splendid David and Charles: I hope to read more about them in the future. 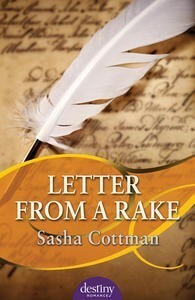 ‘Letter from a Rake’ is a delightful Regency story with twists and secrets interwoven to make it very enjoyable read. I read this book when I was unwell and it provided the perfect ‘comfort food for the brain’ transporting me into the world of London society with enough detail to bring it to life without being boring. Add to the mix an unconventional heroine, Millie, who is missing India where she was born and it finding it hard to fit into the polite and very fashion conscious world where girls ‘Letter from a Rake’ is a delightful Regency story with twists and secrets interwoven to make it very enjoyable read. I read this book when I was unwell and it provided the perfect ‘comfort food for the brain’ transporting me into the world of London society with enough detail to bring it to life without being boring. Add to the mix an unconventional heroine, Millie, who is missing India where she was born and it finding it hard to fit into the polite and very fashion conscious world where girls are vying for ‘a good marriage’. Being overweight is not helping but her dry wit and humour will lift her from her predicament and also provide this story with a real spark. There are some hilarious moments, particularly when she meets Alex. You will need to read this for yourself! Alex, the hero, is a likable rake but through the story proves that he is a worthy match for Millie. Their interactions certainly shine but circumstances conspire against them. To what lengths will a man go and what will he endure to set wrongs right and win the heart of his love. A great read from a debut author and I’m looking forward to reading Sasha Cottman’s next book. A highly enjoyable Regency romance with a twist or three. Twist number one: the heroine Millie, was born and raised in India. As a result, she does not like or adapt well to the London social scene. Why, she even sports a nose-ring and reads the Karma Sutra! Millie is most definitely not your average Regency heroine. Twist number two: Nor is Millie the svelte beauty typical of romance novels. She is, at least at the outset, distinctly chubby. I was a little disappointed that she lost weight with A highly enjoyable Regency romance with a twist or three. Twist number two: Nor is Millie the svelte beauty typical of romance novels. She is, at least at the outset, distinctly chubby. I was a little disappointed that she lost weight within a relatively short period of time simply by increasing her walking – her weight-loss was not crucial to the story – but I certainly appreciated her hero’s dismay at her vanished curves! Twist number three: not content to have a less than ideal heroine, the author also provides us with a dishy but academically-challenged hero. Alexander the Great appears to have dyslexia, although of course it is not labelled as such in the novel. Thanks in part to these twists, Letter from a Rake is a refreshing addition to the well-populated Regency romance genre. Further, they fuel a convincing and nicely-plotted story. In fact, once I passed midway, I could hardly bear to put the book down! Millie Ashton, recently arrived in London from India, doesn’t quite fit in. She has luscious curves, wears a nose-ring and is more outspoken than the misses of the Ton. Alex Radley, Lord Brooke, is the golden boy of the Ton. Not only will he inherit a dukedom one day, but he seems perfect in every way. Only his family knows how he has struggled all his life to conceal a problem which he cannot overcome. Letter From a Rake, is a subtle confection built on layers of well-constructed misunderstandin Millie Ashton, recently arrived in London from India, doesn’t quite fit in. She has luscious curves, wears a nose-ring and is more outspoken than the misses of the Ton. Alex Radley, Lord Brooke, is the golden boy of the Ton. Not only will he inherit a dukedom one day, but he seems perfect in every way. Only his family knows how he has struggled all his life to conceal a problem which he cannot overcome. Letter From a Rake, is a subtle confection built on layers of well-constructed misunderstanding and reinforced with lovely unexpected twists. This is a fresh and exciting tale of missed opportunities, plans gone wrong and humorous set-ups. Sparkling dialogue and likable characters make it a pleasure to read. Millie Ashton is raised in India and is different from the "normal" girls in England. This book takes place when she has just arrived in England. She hates it and just wants to go back to her beloved India. Millie is kinda a outcast in England and no one really gets her. She meets Lucy and becomes fast friends, then Lucy's brother Alex steps in. ( I really like him he was a sweet likable hero) Something big happens and a lot of drama and misunderstand goes down (I don't wan Sweet Regency Romance. I found this book quite different than I was expecting and I enjoyed it. The actual writing was very good - no grammar errors or poorly formed sentences - but I understand this is a first book and it did read like one, in my experience, as I have been reading for many years and had to compare it to many others. The story was fresh and interesting though and I intend to read the next book in the series. Alex was almost 23 and Millie was 20, so this read as a NA story which I was not expecting. Th I found this book quite different than I was expecting and I enjoyed it. The actual writing was very good - no grammar errors or poorly formed sentences - but I understand this is a first book and it did read like one, in my experience, as I have been reading for many years and had to compare it to many others. The story was fresh and interesting though and I intend to read the next book in the series. Oh my goodness, where do I even begin? I fell in LOVE with this book right from the beginning. The female lead, a rather feisty Millie Ashton, is just simply awesome. I love a strong woman who can speak her mind, and speak it she did. I also have a soft spot for these types of stories, so that alone made the read even more enjoyable for me. Upon arriving in London, Miss Ashton certainly meets her match when she is introduced to a certain Lord Brooke. Take a chance on this book; it is wonderful! I liked this story.Spunky heroine, dashing charismatic hero with a secret complete with an understandable mistep that threatens to derail the romance before it begins. I also like the "cliffhanger ending" that set us up for another romance between charecters I've come to root for. A very enjoyable beach read. I haven't read so many historical fiction, as far as I could remember I think this will be the best of all for now. The story plot was great. The romance between the main characters were heart-warming. It was a different take on the novels I would normally read. I was totally immersed with the characters that I didn't want to take my eyes off except after I've finish reading this astonishing novel. Letter from a rake is about soul mates Millie and Alex. The story dates back to 1817, where Millie I haven't read so many historical fiction, as far as I could remember I think this will be the best of all for now. The story plot was great. The romance between the main characters were heart-warming. It was a different take on the novels I would normally read. I was totally immersed with the characters that I didn't want to take my eyes off except after I've finish reading this astonishing novel. Letter from a rake is about soul mates Millie and Alex. The story dates back to 1817, where Millie Ashton, a duke, born and raised in India has just arrived in England with her family. She hates England and keeps on whining about her wish to return back to India. While no body in England welcomed Millie like the way Alex's sister Lucy did, also a duke like herself, she would have sworn to have died living in England. But the only problem is Lucy's second brother Alex, the sight of him looking at her gave shivers. When she gets to know him better, she comes to a conclusion he is not all bad. It is love at first sight for him. Then again when everything was going well, during a fateful night, Alex screws his love by taking Millie away from a public party without his sister and her brother knowing. As they were caught filled with shame, Lucy breaks off her friendship with her, blaming her for being only friends to get closer to his brother like all the other girls did. She gets a wrong impression of Millie and then the next day their whole family is off to Scotland because of the mishap they created. Millie is shocked but she quickly recovers from it. I loved the author's portrayal of Millie Ashton. In almost all the novels the female protagonists are slender with beautiful curves while in this novel, the author has introduced us to a plump, fat girl with curvaceous figure who also wears a sapphire nose ring much to the men's dislike even though she is amazingly the most ravishing, strong female character I have read so far. She is also very likable, valiant and knows how to defend for herself in times of trouble. Alex’s character is the most humorous and also the saddest part in the novel. He has bad tastes in women. When he returns for Millie from Scotland, he is heartbroken to see her new slender figure. I also laughed so much at his innocence and stupidity. He knows how to make thinks harder. He almost puts two ladies in Jeopardy because of the silliest reason he can not write or read. This time his brother doesn't come to his rescue which makes things even harder for him. He has to right the wrongs before Millie chooses the first man who agrees to live with her in India. Overall, I wasn't able to like the first half. I felt the story was rushed .The second half was full of fun and entertainment. The ending part was so touching with Lady Carolice finding the right man like she deserved. I highly recommend this to everyone who likes historical fiction. This was my first time with this author, but probably won't be my last if I need something quick, light, sweet, and/or inexpensive in the Kindle store. Unless I am mistaken, this is the author's first published book. While it does read like a maiden novel in places, it is every bit as polished as some stories that I have read from the big names in the genre. Be warned, though, readers who are all about die-hard historical accuracy will find the vernacular and modern-tone offputting, particularly This was my first time with this author, but probably won't be my last if I need something quick, light, sweet, and/or inexpensive in the Kindle store. Unless I am mistaken, this is the author's first published book. While it does read like a maiden novel in places, it is every bit as polished as some stories that I have read from the big names in the genre. Be warned, though, readers who are all about die-hard historical accuracy will find the vernacular and modern-tone offputting, particularly when coupled with the more traditional Recency romance novel plots and character values. The characters are sweet, if a bit bland, and the plotline is suitable for a new adult-esque historical. It is probably something that six months from now I would be able to tell you the general gist of the story, but would feel like I must be leaving some big part of the plot out for it to have actually been a story arc (even though I really wasn't). There are some rather silly side plots ((view spoiler)[ such as the heroine's weight loss or the hero's dsylexia (hide spoiler)]) that are either tossed out at random or mentioned to be later glossed over completely that I found created some discordant moments in the storytelling, but nothing so egregious as it made me want to put the book down. Me ha gustado bastante, tiene algunos detalles que me han sorprendido y dan un toque original a una novela histórica. Millie no es una joven como las demás, acaba de llegar con su familia de la India, ese pendiente en su nariz es un recordatorio del país que la vio nacer y que añora. Será difícil adaptarse a la vida en Londres. Hasta que en la fiesta que organiza su tío hace amistad con Lucy, una joven peculiar que resulta ser la hija de un duque. Alex, hermano de Lucy, no tiene un primer encuentr Me ha gustado bastante, tiene algunos detalles que me han sorprendido y dan un toque original a una novela histórica. Alex, hermano de Lucy, no tiene un primer encuentro soñado con Millie. Es más, la humilla sin ser consciente de ello. A partir de ese momento deberán comportarse y tratar de superar sus diferencias por el bien de Lucy. Pero la atracción de ambos les traerá más de un dolor de cabeza. Sasha lives with her husband, her university student daughter and a cat who demands a starring role in the next book. She has found new hiding spots for he Born in England, but raised in Australia, Sasha has a love for both countries. Having her heart in two places has created a love for travel, which at last count was to over 55 countries. A travel guide is always on her pile of new books to read. Sasha lives with her husband, her university student daughter and a cat who demands a starring role in the next book. She has found new hiding spots for her secret chocolate stash.